At the beginning of the 90's Nordic skating (a somewhat quaint version of other Nordic products) was a development of the Nordic trend. It simulates the movement of open-air ski skating without snow as was already possible with roller skiing or roller ski skating. In the strictest sense, roller skiing in the skating style falls under the category of Nordic skating. At first Nordic skating was exercised on inline skates, and due to the upcoming inline skater trend many sportsmen already owned inline skates. Only the poles were missing for a new sport to be born. Although special inline devices were developed for Nordic skating the sport is still is a bit unattractive to the masses due to its high accident risk. For this version complete protective equipment is strongly recommended. Nordic inline skating is also called Nordic blading. In the meanwhile, Nordic skating can be enjoy in a much safer way with pneumatic tired cross-skates; these also work for off-roading. In the 90's, there were sporadic cross-skates coming onto the market, but for different reasons they were not accepted. Since then, Powerslide and Skike have been manufacturing robust cross-skates for daily training and to get the trend going. You can classify Nordic skating as a mixture of cross-skating, which is only possible with pneumatic tired skates, and street skating. On even ground street skating works for all skates including cross-skates, and for roller skis which have plastic wheels. The physical and training benefits of Nordic skating are similar to those of cross-country skiing. 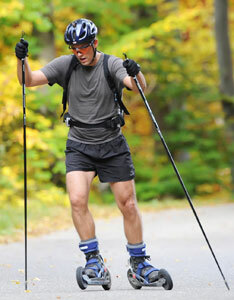 However, due to the increased speed of Nordic skating on plastic wheels the muscles in the arms, the upper part of the body and the torso cannot be trained as effectively as in cross-country skiing. Braked or pneumatic wheels not only provide improved training but also ensure that potential falls take place at lower speeds. 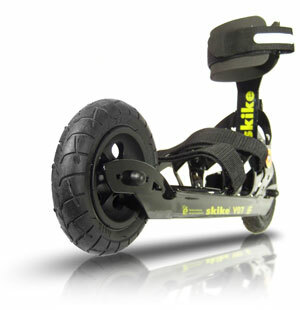 With their pneumatic tires cross-skates have exactly this advantage and so have become more popular. When using plastic wheels Nordic skating is limited to wide asphalt streets. Pneumatic tires offer the possibility to choose more training routes such as off-road, in woodland, side streets and bicycle lanes, where the poles can grab better and more comfortably.